As Irving Weissman drives past Cannery Row in Monterey, California, in a light rain, he waves an open palm like an impresario, showing off the picturesque bay and craggy coastline. “Spectacular,” Weissman says as he pulls onto the grounds of the Hopkins Marine Station. He’s a distinguished immunologist, best known for his studies of blood cells, but he’s also a straight-shooting Montana native who sports the type of rugged beard you might expect on a fur trader, his father’s profession. When he sees David Epel walking by, Weissman stops his black Lexus sedan and lowers a window. “How can you sleep at night?” asks Epel, a marine biologist who investigates fertilization in sea urchins. Epel and Weissman are marveling over the decision made by the voters of California in November 2004 to spend up to $3 billion in the state over the next ten years on human embryonic stem cell research. Known as Proposition 71, the initiative has created a gold rush fever that’s caught the attention of stem cell scientists everywhere. Many prospectors envision rewards well beyond dollars: new treatments and possibly cures for a wide array of medical conditions, such as Alzheimer’s, diabetes, Parkinson’s, osteoporosis, multiple sclerosis, spinal cord injury, cancer and heart disease. Passage of the stem cell referendum sent a blaring signal to Washington. President Bush, backed by leading Republicans in Congress who share his beliefs that a human embryo has the same moral rights as a person, has strictly limited the use of federal funds to pursue this avenue of scientific inquiry. One bill in the U.S. Senate even proposes to criminalize what Weissman and others see as the single most promising aspect of the research—the ability to use an ailing patient’s own cells to develop treatments. So Prop. 71, which was supported by Gov. Arnold Schwarzenegger, a Republican, and garnered a whopping 59 percent of the vote, is almost a declaration of secession. And New Jersey, Massachusetts, Connecticut, Wisconsin and several other states have proposed similar legislation to fund stem cell research within their own borders. Even so, some stem cell scientists in the United States worry that they are falling behind their colleagues in other countries. Weissman, who has a small lab at the Hopkins Marine Station and a much larger one 90 miles away at its parent institution, Stanford University, played a starring role in the Prop. 71 campaign. He helped shape the proposition and attracted crucial funding for it, meeting privately with politicians, influential Hollywood producers and other deep-pocketed supporters including Bill Gates. Weissman also became a go-to expert for the news media and even starred in a TV ad for the “Yes on 71” campaign. He has taken up the cause before the U.S. Congress, President Bush’s Council on Bioethics and the late Pope John Paul II, warning at every turn that limiting or blocking stem cell research would hamper development of potential treatments and cures—a moral dilemma of its own. The stem cell frontier provokes some of the most contentious questions in society: When does life begin? Should religious belief play a role in shaping laws and regulations? How much should governments limit research? Does the fate of an embryo matter as much as the health of a living person? 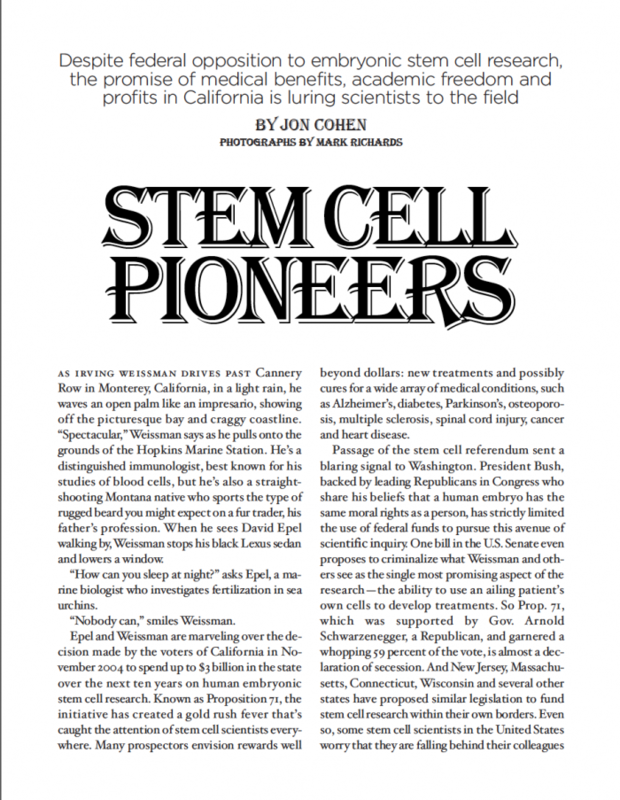 Before leaving Epel at the Hopkins Marine Station, Weissman confides that he is attempting to lure a prominent human embryonic stem cell researcher from Massachusetts to Stanford—part of Weissman’s continued efforts to bolster California’s prominence in the field. The researcher is scheduled to lecture at the Hopkins Marine Station. “I thought I would drive him down and try to convince him how nice the West Coast is,” says Weissman. Then he gazes at Monterey Bay and grins. “Let’s hope it’s really sunny that day,” he says. Stem cells, unlike all the other cells in the body, can copy themselves indefinitely. So-called adult stem cells are found in many parts of the body, constantly rejuvenating the brain, remodeling arteries so blood can scoot around clogs, and growing new skin to heal wounds. Virtually no one objects to studies on adult stem cells. In a landmark experiment in 1988, Weissman’s lab isolated adult stem cells from mouse bone marrow. These mouse stem cells were able to create the entire fleet of blood cells, including lymphocytes that help form the immune system, platelets that promote clotting, and red blood cells that shuttle oxygen to tissues. Three years later, Weissman’s lab isolated similar adult stem cells from humans. The discovery paved the way to improved bone marrow transplantation in cancer patients who had received radiation or chemotherapy. But adult stem cells, versatile as they are, have more limited power than embryonic stem cells, which can turn into any type of cell in the body. In the late 1990s, two independent discoveries pushed embryonic stem cells to center stage. First, scientists in Scotland rocked the world in February 1997 with the announcement that they had created a cloned lamb, Dolly. Ian Wilmut and his co-workers accomplished that feat by removing a cell from the body of a 6-year-old ewe and then fusing it with a sheep egg that the scientists had hollowed out to remove its genetic material. The egg functioned like a time machine. It somehow made a regular old body cell revert all the way back to its embryonic root and behave like a normal fertilized egg. The rejuvenated cell then developed into Dolly. Much as Dolly wowed the public, her existence raised the question of whether a human being could be created by cloning. The prospect sent shivers through scientific, political and religious communities. The second breakthrough was announced in November 1998. Scientists led by James Thomson of the University of Wisconsin had grown human embryonic stem cells in a culture dish, a scientific first. They’d constructed embryonic stem cell “lines” that, like a yogurt or sourdough culture, could renew in perpetuity and be propagated in still more cell cultures. These cell lines, which a nonprofit subsidiary of the University of Wisconsin would soon sell to researchers around the world (two vials, $5,000), made minds race. Scientists could attempt to turn the embryonic cells into any tissue the body makes. Imagine: an endless supply of young neurons to fix damaged brains, cardiac cells to repair damaged hearts, or pancreatic cells to create insulin for people with diabetes. Maybe they could even regenerate whole organs. To date, scientists worldwide have made more than 100 different human embryonic cell lines. Still, the existing lines have serious limitations. Most have been grown on a lattice of mouse embryonic skin cells for support. Consequently, the human embryonic cells are contaminated by mouse cells, and though they’re still useful for research, Weissman says, they are “absolutely useless” to develop therapies. Even if they weren’t contaminated, the existing lines probably could help only a patient who had a close genetic match to the embryonic stem cells, as the patient’s immune system likely would destroy any cells that got transplanted. And cells kept in culture can change, acquiring mutations that could lead them to cause cancer or other diseases. Combining the lessons of Dolly and embryonic stem cell lines, however, suggested a mind-blowing possibility. If a scientist took the nucleus from, say, a human patient’s skin cell and put it into a scooped out human egg—the technique that created Dolly—it could become an embryo. One could convert its cells into a cell line—rather than allowing it to develop into a fetus by implanting it into a uterus—coax it into whatever type of cells the patient needs, and treat an ailment without fear of immune rejection. This process is called therapeutic cloning, as opposed to reproductive cloning, and even though it was partly inspired by Dolly, it has nothing to do with creating cloned animals or human babies. Embryonic stem cell research is entangled with the issue of abortion in myriad ways, and indeed the Bush administration’s position has roots in the 1973 Roe v. Wade decision that made abortion legal in the United States. Worried that scientists might use aborted embryos or fetuses for research, Congress in 1974 passed a “temporary moratorium”on the federal funding of any such work. Subsequent legislation extended this ban to the creation of embryos. With the breakthroughs in stem cell research in the late 1990s, Weissman and many other scientists urged Congressto reconsider this sweeping ban. Then, on August 9, 2001, President Bush gave a speech on national televisionfrom his Texas ranch that focused on stem cell research, describing a new policy that attempted to please people on both sides of the issue. Bush declared that researchers who used federal funds could work on human embryonic stem cell lines that scientists had already created but could not make any new ones. Bush, who characterized the issue as “one of the most profound of our time,” said that he was worried “about a culture that devalues life” and said that he had arrived at this compromise after “prayer and considerable reflection.” About two dozen stem cell lines meet his criteria for federal funding. Most embryonic stem cell lines, including the federally approved lines from Wisconsin, are derived from embryos donated by patients at in vitro fertilization clinics. Many couples undergoing IVF treatment, which fails about 70 percent of the time, create more embryos than can be implanted in a given treatment session, and they freeze the “excess” ones for possible future use. (A2003 study estimated that assisted reproduction clinics in the United States stored about 400,000 frozen embryos, an untold number of which will ultimately be destroyed.) Stem cell scientists working with donated embryos typically extract cells from the embryo when it is 3 to 5 days old and about the size of the period at the end of this sentence, and discard the rest. The researchers do not culture any cells that are programmed to turn into a placenta. That’s one reason an embryonic stem cell line can’t develop into a baby. Congress, with support from key Republicans such as Bill Frist and Orrin Hatch, appears likely to pass a bill next year that would allow researchers to create new lines with donated, excess embryos, but President Bush has vowed to veto it. Critics say that the federal regulations on embryonic stem cell research have relegated the U.S. National Institutes of Health (NIH), which has bankrolled research on everything from cancer and heart disease to diabetes and AIDS, to bit-player status in the stem cell field. Singapore, the United Kingdom, Australia, Israel and China, they contend, have rushed to fill the vacuum by funding their own scientists. South Korean scientists, to the surprise of many, were the first to create human embryonic stem cell lines using cloning—the highly anticipated first step toward developing personalized stem cell therapies. Cell biologist Larry Goldstein of the University of California at San Diego, who worked closely with Weissman on the Prop. 71 campaign, started his first project with human embryonic stem cells in the summer of 2004. The research takes place in a small room that discreetly has no indication of what goes on inside. Incubators in the room hold federally approved embryonic stem cell lines, one of which came from the Wisconsin researchers, and others made since August 9, 2001, by groups not using NIH funds. Little round red and green stickers dot all of the boxes on the shelves to indicate whether supplies were purchased with federal money, because strict penalties would be imposed if ever a researcher grew nonfederally approved cells using a petri dish that NIH paid for. Goldstein wants to use his stem cell lines to study Alzheimer’s disease. He plans to splice genes that are known to cause a rare type of inherited Alzheimer’s into the cultured cells, and then test different hypotheses about what causes the disease. If a clear mechanism emerges, researchers may use the cell lines to screen various experimental drugs, to see which ones prevent the cells from developing characteristic signs of Alzheimer’s disease. This use of embryonic stem cell lines “has been a completely underemphasized part of the discussion,” he says. For now, though, Goldstein’s lab simply wants to figure out which lines grow best in which cell-feeding broths, which have odd-sounding names like Modified Eagle Serum and Leukemia Inhibitory Factor. “We’re at the very, very beginning stages,” says Nikole Kimes. Kimes snaps on a pair of latex gloves and sprays her hands with disinfectant. She removes a clear, plastic petri dish from an incubator that’s about the size of a dorm room fridge. The incubator is set at 98.6 degrees Fahrenheit—human body temperature. Kimes moves to a lab bench that’s covered by a ventilation hood, and she slides the petri dish under the lens of a microscope. The magnified cells look like the tiny bubbles that cluster at the bottom of a pot of water just before it begins to a boil. Mouse connective tissue, which forms a platform for the cells to grow on, resembles long grains of rice. Normal embryos take on a mulberry shape as they grow. Although initially there’s a symmetry to the bubbles in the petri dish, they do not look like a mulberry, nor will they ever take on that shapeas they grow. For one thing, they lack placental cells that help form early embryos. As a normal embryo grows, its cells also change shape as they lose their “stemness”and commit themselves to becoming, say, muscle, liver or bone cells. Kimes, however, is doing everything she can to keep the embryonic stem cells in a state of perpetual bachelorhood in which they make no commitments. Kimes picks up an instrument that resembles a toy gun with a foot-long glass straw, called a pipette, attached to it. She gently maneuvers the tip of the pipette into the petri dish, and when she pulls a trigger, dead cells and fluid rush up into the pipette. The back end of the instrument has a plastic tube that leads to a large flask that collects the detritus. She replaces the pipette with a fresh one that she takes from a box with a green dot—these are nonfederally approved cells—and then uses it to slowly add fresh medium, the color of pale cranberry juice, to the dish. She then slips the dish back into the incubator. She will do this again and again, most every day of the week, sometimes removing samples of cells to see if their chromosomes have become mutated. Robert Klein is a California real estate developer and lawyer who has movie star good looks and a winning smile. Klein, who worked on the legislation’s language and the financing of Prop. 71 with bonds, became involved in the issue partly because his 15-year-old son has diabetes. Prop. 71, among other things, provides funds for a new state agency, the California Institute for Regenerative Medicine. Its governing board will award grants to scientists based on the quality of their research proposals, which will be evaluated by other scientists. In September, the institute, headquartered in San Francisco, announced that its first grants will train scientists and clinicians in stem cell biology and attendant ethical and legal issues. The institute plans to fund stem cell research that is done within the state’s borders, “has the greatest potential for therapies and cures” and is “unlikely” to receive federal support. For now, however, lawsuits filed by opponents of Prop. 71 are holding up the distribution of money. Klein, who heads a commission that oversees the new institute, says Prop. 71 will ultimately see up to a 236 percent return on its $3 billion investment. Klein gets his numbers from an analysis prepared by economic consultants during the campaign. The analysis predicts that new treatments will lead to healthcare savings, and that state coffers will enjoy revenues from taxes paid by biotech companies that flock to the field, as well as from a scheme that shares royalties if discoveries made with Prop. 71 funds come to market. This sunny forecast assumes that stem cell research will lead to medical advances for six diseases within 15 years—a promise that no one, of course, can make. Even the cheeriest prognosticators suggest it will take at least five years before any medicine based on human embryonic stem cell research proves to be safe and effective. And while $3 billion may seem like a huge budget, it has to last ten years and pay for both basic research and costly clinical trials. Klein says California is putting its chips on “intellectual infrastructure,” the equivalent of the bridges, harbors and roads that forward-thinking states built in the last century. “You’re investing in knowledge that can have a 50 year or longer life of value,” says Klein, who sounds like a politician on the stump but insists he has no ambition to run for public office. A short walk from Irv Weissman’s spacious office and sprawling lab on the Stanford campusis the cramped workplace of one of his principal adversaries in the stem cell debates, William Hurlbut, 59, a physician. Hurlbut earned his undergraduate and medical degrees at Stanford and has known Weissman for 30 years. As a member of the President’s Council on Bioethics, he has President Bush’s ear. But many of his academic counterparts all but groan when he speaks: not only does Hurlbut mix religion and science, he proposes what they see as dubious scientific solutions to sidestep the ethical minefields. “I’m basically persona non grata, as you can imagine, with my colleagues,” says Hurlbut. Hurlbut also has a child whose condition helps shape his thinking. Three decades ago, a week after he graduated from medical school, Hurlbut’s wife went into labor with a breech baby, which required an emergency Caesarean section. Just then, he says, another woman giving birth at the hospital had a sudden, life-threatening problem. “Everybody ran to take care of her and left my wife and baby unattended, and by the time they got back, there was no heartbeat,” says Hurlbut. His baby daughter survived, but was severely brain damaged. “From that point, life became so difficult I simply couldn’t return to clinical medicine,” says Hurlbut, who went on to do postdoctoral studies in Christian theology and medical ethics. Today, he teaches biomedical ethics at Stanford University. His daughter Sarah is 30 and has serious cognitive and emotional disabilities, but Hurlbut says “by some good blessing she is much better off than anyone expected,” and can walk and talk, remember things, and “see deeply into the hearts of others. . . . She’s a perfectly worthy-to-be-alive human being,” he says. Hurlbut ended up rejecting the 14-day argument, but he arrived at what he considers an ethically acceptable way forward. He advocates what he calls “altered nuclear transfer.” Nuclear transfer is the procedure that created Dolly, by merging a body cell with an emptied egg. Hurlbut proposed that researchers alter genes during the nuclear transfer process so that the cells would not turn into a functional embryo but could still yield embryonic stem cells. In October, researchers from the Massachusetts Institute of Technology showed that they could do this in mouse embryos. Hurlbut praised the work as a big step forward. Scientists recently promoted another way to dodge ethical questions about embryonic stem cells. IVF clinics routinely remove one cell from an embryo implantation to test it for genetic abnormalities. Babies born from embryos so modified do not appear to suffer any harm. In October, researchers working with mice reported that they could make an embryonic cell line from such a removed, single cell. Weissman cautioned, however, that it was “highly speculative” whether the same procedure would work in humans. And Weissman, like many of his colleagues, sees an ethical dilemma created by the notion that today’s research should stop, as many opponents of embryonic stem cell research demand, until scientists discover less contentious methods. “If we delay, and in that delay, for no good reason as far as I could see, people are dying who had a chance to live, that’s morally unacceptable to me,” he says. Weissman points out that most people who object to destroying human embryos for research don’t protest IVF itself, which routinely produces embryos that end up being destroyed. Hurlbut, for his part, calls this seeming contradiction “the single hardest question,” but says the issue is ethically different because IVF clinics aim to create life. Jaenisch is the prominent Massachusetts human embryonic stem cell researcher whom Weissman hopes to recruit to Stanford. Jaenisch and his colleagues at the Whitehead Institute for Biomedical Research in Cambridge are investigating the mechanisms by which an egg that has had its own genetic material removed, when fused with a body cell, instructs that cell to revert to an embryonic one—the process behind Dolly the sheep and made-to-order embryonic stem cell lines. If researchers can solve this mystery, they will vastly simplify their work. The current method for cloning depends on eggs that women donate—a medical procedure that involves injecting fertility drugs into donors and having follicles removed from their ovaries, which carries some risk and is, at the very least, uncomfortable. If scientists could somehow reprogram adult cells to turn into embryonic stem cells on their own, ethical debates might dissolve. Scientists no longer would need to create or destroy embryos to harvest embryonic stem cells. The Salk Institute gathering attracted a who’s who of stem cell researchers from around the globe, who together, have made progress using the cells to cure diabetes, Parkinson’s, immune deficiencies, heart disease and brain injuries—in mice. When it comes to human disease, no group has moved further than the one led by another speaker at the meeting, South Korea’s Woo Suk Hwang, whose team created, in 2004, the first human embryonic stem cell lines using cloning techniques. (It was also Hwang and his colleagues who cloned the first dog, an Afghan hound named Snuppy, reported this past August.) His lab has now made embryonic cell lines from people who have spinal cord injury or immune disorders, a first step toward using personalized cultured cells to study these afflictions. Scientific meetings function something like county fairs, except instead of trotting out prize Holsteins or giant tomatoes, participants show off their latest data and ideas. Most of the advances are incremental and would have little meaning to people who don’t wear white lab coats. But many of the ideas, which rely more on imagination than evidence, are dazzling. One researcher talks about her dream of engineering the scaffolding of a liver with synthetic material, and then implanting liver stem cells onto it to make a functioning organ. Several scientists discuss the possibility that cancer is caused by haywire stem cells. Others wonder whether chemicals secreted by stem cells, rather than the cells themselves, might have healing powers. A Harvard University researcher opens his talk by thanking Weissman and Goldstein for their work on Prop. 71.”You guys have done a tremendous amount for the field and our nation,” he says. Next Post Protect or Disinhibit?